A Kansas state court judge just halted that state's dual ballot system. While Arizona has a nearly-identical system, it appears the state is moving forward with federal-only ballots for some in next month's primary election. The proof-of-citizenship related issue cost Arizona taxpayers a few hundred thousand dollars in 2014. Earlier this month, the American Civil Liberties Union (ACLU) sued Kansas, which has a nearly- identical two-track system as Arizona. The two states require proof of citizenship when someone registers to vote, but the national voter registration forms have not required the proof. Thus, after the issue went to the U.S. Supreme Court, Kansas Secretary of State Kris Kobach and former Arizona Attorney General Tom Horne determined before the 2014 election that those who have not provided proof would only get a ballot for President and Congress. This afternoon, the Kansas judge ruled from the bench that the approximately 17,500 Kansans impacted would be permitted to vote the full ballot, including for state and local elections. After a court defeat on the dual track system, Kobach had tried to implement a temporary regulation that would keep it in place for this election , and that formed part of the basis for the ACLU suit. Earlier today, Secretary of State Michele Reagan's office told Arizona's Politics that counties were going forward with "the bifurcated ballot until something changes in the law." Last week, Communications Director Matt Roberts indicated that they have been saving taxpayers' money by hanging back and observing Kansas's battles, although "any court outcome will obviously impact us." Two years ago, Maricopa County had estimated that the dual track ballots cost taxpayers $250,000. Each other county had smaller scale expenses, as they had to print federal-only ballots and make them available at every polling place in the state. Here is the ACLU news release announcing the Kansas court's TRO ruling this evening. Arizona is obviously not bound by that state court's decision. Former Arizona Rep. Gabby Giffords took the podium - along with her husband and Space Shuttle Commander Mark Kelly - to bring her efforts to reduce gun violence to the Democratic National Convention. Giffords and Kelly have been vocal proponents for universal background checks since a would-be assassin shot her in the head at a Congressional town hall event in Tucson in January 2011. "Strong women get things done," Giffords said tonight about Hillary, though she could have also been talking about herself. Freshman Arizona Rep. Ruben Gallego (D-CD7) took the stage at the Democratic National Convention this evening, and attacked Republican Presidential nominee Donald Trump hard about his attempts to "scam" people into believing he cares about veterans. Gallego contrasted the values learned during his experience as a Marine in Iraq; "Donald Trump is a man who questions the loyalty of those who serve our country without ever himself serving. That is not patriotic. Service and sacrifice? Donald Trump says about Senator McCain 'lots of people were not captured.' As a Marine, as an American, I am offended." He then hit Trump's use of veterans: "One of my fellow Marines called Trump University a complete con. I say that about Donald Trump himself. Donald Trump is a scam artist. He is trying to pull off the ultimate scam, pretending he cares about veterans. Hillary Clinton is the real deal." Former Arizona Rep. Gabrielle Giffords will be addressing the convention later this evening. Maricopa County Sheriff Joe Arpaio's attorneys filed an 11 page memorandum with the Court today, telling Judge G. Murray Snow that his orders in the racial-profiling case have "changed" the MCSO and made it "better", but if Arpaio and/or others are facing criminal contempt charges, it "may hinder (further) compliance". Arpaio's attorneys also offered to have the Sheriff put at least $100,000 of his personal "skin in the game". Judge Snow permitted the "Sheriff Arpaio's Supplemental Brief Re: Criminal Contempt Referral" to be filed by today. The bulk is listing the actions that the MCSO has undertaken over the past several years, mostly to comply with the Court's orders and the Monitor's recommendations. Arpaio attorney Mel McDonald goes on to point out that it would be smarter for Judge Snow to keep the possibility of a criminal contempt referral "in the Court's future arsenal of possible options. Imposing that remedy at this time may hinder compliance with the Court's July 20th and July 22nd orders by pulling resources, and the Sheriff's energy and time, from the civil directives to the criminal referral and criminal defense." Lastly, Arpaio is "reiterat(ing) that, as an alternative to a referral for criminal contempt, he will personally put 'skin in the game' consistent with the suggestions discussed in 2015." (emphasis in original) At that time, a minimum of $100,000 - to go to a local Hispanic civil rights organization - was discussed. Plaintiffs' attorneys' fees - which County taxpayers are responsible for - in the long-running racial profiling case are now north of $10 Million. Judge Snow could make a decision about referring Arpaio and several others in the organization for a criminal contempt investigation at any point after tonight. Arizona Rep. Raul Grijalva (D-CD3) spoke at the Democratic National Convention in Philadelphia this afternoon, as part of today's liberal theme. As co-chair of the Congressional Progressive Caucus and one of the first members of Congress to endorse Sen. Bernie Sanders for the Presidential nomination, his full-throated support of presumptive nominee Hillary Clinton was deemed important enough to put him on the Monday roster (along with Sanders, Sen. Elizabeth Warren, Michelle Obama and others). MR. GRIJALVA: GOOD EVENING. I STAND HERE IN SUPPORT OF HILLARY CLINTON. ON BEHALF OF OUR FUTURE AND IN RECOGNITION OF OUR PROUD PAST, I AM REMINDED TODAY OF ALL THE IMPORTANT FIGHTS OF THE PAST 50 YEARS, FOUGHT AND WON BY PROGRESSIVE LEADERS OF OUR PARTY. I CAME OF AGE -- FOR WOMEN'S RIGHTS, FOR CLEAN AIR, CLEAN WATER, AND FOR PEACE, AND THE MANY OTHER GREAT -- IN THIS COUNTRY THAT MADE IT A BETTER PLACE. I CAME OF AGE WITH A PARTY THAT BELIEVED THE PUBLIC GOOD, NOT THE SIZE OF A DONOR'S CHECK, WAS THE TRUE MEASURE OF AN IDEA. AND, MY FRIENDS, A NEW GENERATION IS COMING OF AGE TODAY. MILLIONS OF YOUNG PEOPLE, ALL ETHNICITIES, ALL BACKGROUNDS, ALL INCOME LEVELS, ARE LOOKING FOR US TO STAY TRUE TO THE PARTY'S GREAT IDEALS. THEY LOOK TO OUR HOPE THAT WE WILL PUT THEIR NEEDS ABOVE THOSE OF THE ALREADY RICH AND POWERFUL. THEIR IDEALISM, THEIR OPTIMISM, THEIR BELIEF IN AMERICA, THEY ARE NO DIFFERENT THAN THE IDEALISM THAT BUILT THIS NATION OR THE IDEALISM THAT WON PROGRESSIVE FIGHTS OF A GENERATION AGO. THEIR IDEALISM IS JUST AS POWERFUL AND, YES, JUST AS FRAGILE. IN THIS ELECTION AND IN EVERYTHING WE DO, WE MUST REMEMBER THAT AND BE WORTHY OF IT. I WOULD NOT BE HERE TODAY SUPPORTING OUR NOMINEE IF THE DEMOCRATS OF 50 YEARS HAD NOT HAD THEIR CURRENT. I WOULD NOT BE HERE IF OUR PARTY WAS BUILT IN THE LIKES OF DONALD TRUMP WHO IS TRYING TO MAKE OUR COUNTRY meaner, hateful MEET HER, APRIL, MORE DIVIDED, AND MORE FEARFUL. I AM PROUD TO BE PART OF A MOVEMENT THAT IS GOING TO BEAT RONALD TRUMP. -- DONALD TRUMP, THAT IS GOING TO HELP ELECT HILLARY CLINTON. THAT IDEALISM IS A GOVERNING PHILOSOPHY WE SHOULD BE PROUD OF. NOW IT IS TIME. LET'S GO WIN THIS. LET'S WIN IT FOR OUR PEOPLE. AND LET'S WIN IT FOR OUR NATION. THANK YOU. By the way, he came on to a great riff from "Fly Like An Eagle". The house band is hot! 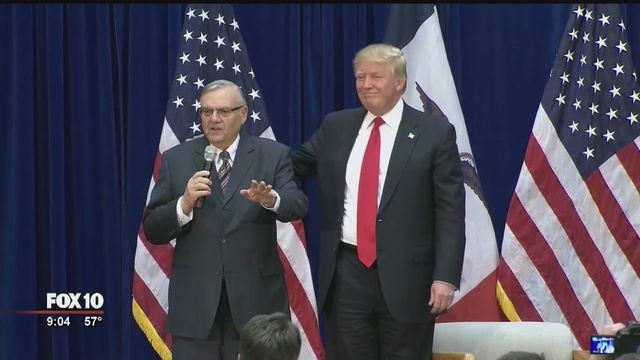 WATCH/READ: Sheriff Joe Arpaio Speech At Republican National Convention - "My Most Important Mission Has Just Begun"
Maricopa County Sheriff Joe Arpaio delivered a semi-primetime speech tonight at the last night of the Republican National Convention. He called helping get Presidential nominee Donald Trump elected "my most important mission," and praised Trump for spending five minutes on the phone chatting with wife Ava for five minutes after she was diagnosed with cancer. Arpaio's 5 1/2 minute speech focused on border enforcement, starting just before the primetime programming (back East) began, and ending just afterwards. Maricopa County Sheriff and Trump surrogate Joe Arpaio will be speaking for a few minutes at the Republican National Convention tonight. But first, he hopes to see your name on his donor list. I am honored to tell you that TONIGHT at 8 PM EST I have the privilege of speaking before the Republican National Convention! Before I step on the stage tonight, my campaign manager will be giving me a list of everyone who fully supports my re-election campaign. I asked that he made sure to reach out to you – one of my most loyal supporters. Will I see your name? Trust me MItch, you will want to hear what I have to say tonight. As you know, I don't tip toe around the truth, and I don't sugar coat things with politically correct rhetoric. I am all but certain the media will try to twist my words. That's why it would mean so much to me if you could take a moment now to join my list of people supporting me right now, before I step on stage before millions of people – and media who will undoubtedly try to tear apart my message. I've always counted on principled conservatives like you to stand with me, MItch. And I hope you will do so now – before I go on stage at the Republican National Convention tonight at 8 PM EST. It would mean so much to me to see your name on the list of supporters before I take the stage tonight. The text of the email is the most we can provide at this time - it has a couple of vague hints about what he might have to say. Willems tells Arizona's Politics that the text of the speech is not yet available to either him or the media. *Unfortunately, it will be hard for the Sheriff to find your name. His donor list for the first half of 2016 runs 502 pages and contains $2M of donations. And, that's without listing all of the $50 or less donations! Former Arizona State Senator Jack Harper today offered to hand over Twitter handles he had reserved in March in case Trump picked Indiana Governor Mike Pence as his running mate. Harper - who is attending the convention as an "alternate" in Arizona's delegation - tells Arizona's Politics he made his offer through AZ GOP Chair Robert Graham. Harper started becoming a Twitter-handle-squatter last November, when he decided to protect @VPCarlyFiorina. In February, he placed bets* on three female governors: Arizona's Jan Brewer (below), New Mexico's Susana Martinez and Oklahoma's Mary Fallin. In March, he added Texas Senator Ted Cruz while acknowledging that it would be unlikely. And, in April, Harper reserved accounts for John Bolton and Scott Walker. In May, he was looking out for Rick Perry and Newt Gingrich. It was not until July 10 that Harper opened @VPMikePence and @VPMike_Pence. Word leaked out a few days later that Trump had picked Pence. Harper acknowledges that he is also using the reserved accounts as a conversation-starter, and that he has taken a photo with Fallin and has sought out Bolton. *Unlike domain squatting, Twitter-handle-squatting involves no monetary risk. Only time. Harper indicates he set up a Gmail account for each, in order to open the Twitter account. The Secretary of State's office does not have to take their foot off of the gas when validating petitions to place an initiative raising the minimum wage to $12/hour on the November ballot. Last night, Arizona's Politics reported that the Arizona Restaurant Association had asked for an emergency hearing asking for the slowdown. The Secretary of State's Office informs us that the Court denied the request for a temporary restraining order. "We are permitted to process petitions as quickly as we see fit and aren't required to slow down," says Communications Director Matt Roberts. The initial hearing on the challenge to the minimum wage petitions is set for next Thursday. In March, Trump's New Arizona Campaign Manager Said GOP Nominee Could Be "Disastrous"
GOP Presidential nominee Donald Trump's campaign announced that Arizona political consultant Brian Seitchik would become the State Director for the general election campaign to keep Arizona in the red. It was only 4 months ago that Seitchik pronounced a possible Trump campaign as potentially "disastrous" for the Republican Party. Seitchik has also been working as a consultant for Christine Jones' campaign for Congress in CD5. The recently-maligned Arizona Secretary of State's Office is working TOO quickly on the petition signatures for the minimum wage initiative. That's the claim by the Arizona Restaurant Association today, and the court has set an emergency hearing for 4pm this afternoon. The Secretary of State's office informed Arizona's Politics today that it hopes to send out samples of the marijuana legalization initiative today, the minimum wage on Friday, and the hospital executive salary cap initiative the following Friday. By law, the Secretary of State does some initial checks on the petitions before sending samples to the county recorders to test the validity of the signatures on the petitions. Their office wants to get the petition samples to the counties as quickly as possible, and staggering them also makes the job simpler for the counties. The initial court hearing on the Restaurant Association's challenge is scheduled for next Thursday, and one of the allegations in their challenge is that the Secretary of State's database of paid and out of state circulators is incomplete and that some of the petitions will need to be pulled. That would impact the sample sent to the Recorders. The minimum wage hearing was set further down the road (than the other two) because the assigned judge is on vacation this week, according to the motion. Therefore, today's hearing will be in front of Judge Gerlach (who is also handling the hospital initiative case). 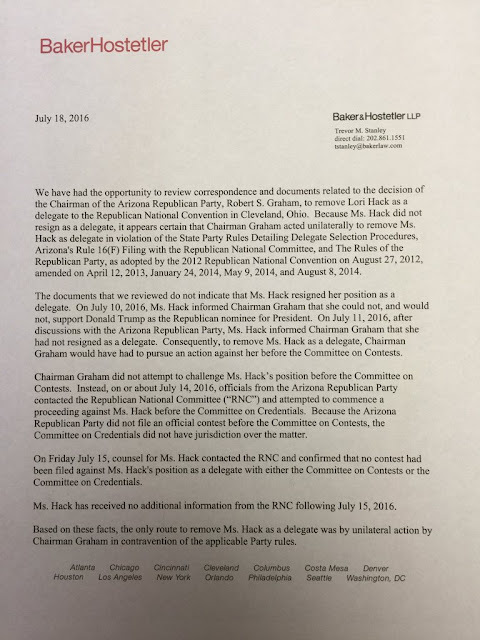 Lori Hack, former Arizona delegate to the Republican National Convention currently underway in Cleveland, obtained a legal opinion last night concluding that AZ GOP Chair Robert Graham violated state party rules when he removed her based on her anti-Trump views. Hack forwarded the letter to Arizona's Politics this morning. (below) In response to questions, she said "I am in the convention as a guest", but twice declined to say whether any action to restore her to the Arizona delegation is being taken. 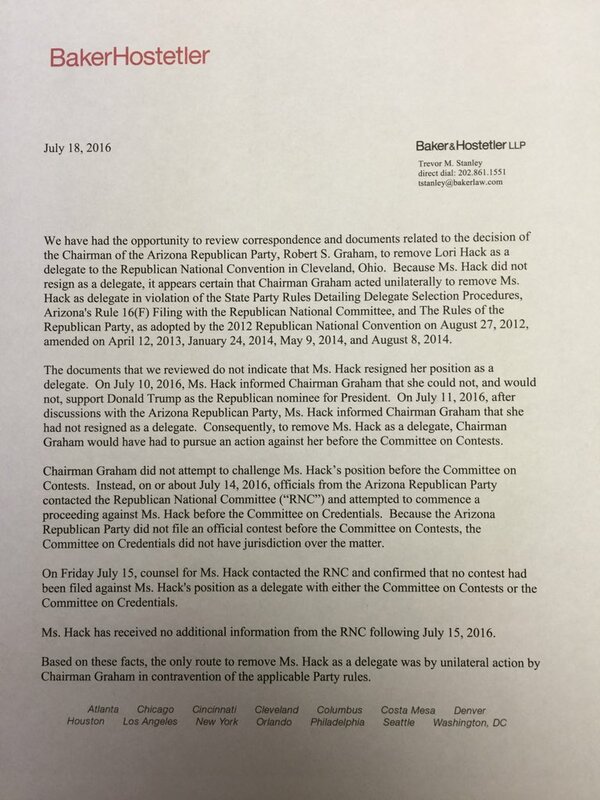 The letter, which Hack released as what she calls a "Public Service Announcement", attorney Trevor Stanley from major law firm BakerHostetler, concludes that Graham "acted unilaterally" and in "contravention" of state party delegate selection rules. Stanley also notes that Ms. Hack's counsel (possibly him) had checked with the RNC on Friday and that neither Graham nor anyone else had filed a formal action to remove her as a delegate. Graham, who is considering mounting a campaign to become the next Chair of the Republican National Committee, was quoted in yesterday's Arizona Republic as saying Hack "is misleading the entire nation by saying she went through some process to restore her credentials." Earlier today, Arizona's Politics reported on the court challenges filed yesterday against two proposed ballot initiatives which were turned in last week. Now, thanks to the Secretary of State's Office, we have copies of the Complaints. Both suits were filed by the same law firm (Coppersmith Brockelman), representing the Arizona Chamber of Commerce and Industry for the hospital executive salary cap measure, and the Arizona Restaurant Association challenging the minimum wage measure. As discussed in the earlier article, the two new challenges contain MOSTLY general allegations about petition circulators and the signatures. This is partly because Arizona law now requires a challenge - to the legitimacy of the circulators - within 5 court days. The suit against the hospital salary initiative has a couple of specific allegations not made in the other suit (against minimum wage). The Chamber alleges that the initiative's committee was never properly registered and that all signatures therefore must be thrown out. It also claims that the petition forms did not substantially comply with the statutes because they had 12 (instead of 15) signature lines and because they did not have a required warning (unlawful to sign before initiative is registered with the state). * It is unclear from the complaints how that might impact the complaint, as it would appear that if the circulator did register (as alleged), not being included in the database would not disqualify the registration (to remove the signatures he or she collected). The Arizona Chamber of Commerce has a full court calendar next week, with news that it has filed a challenge to the hospital executive salary cap ballot initiative; the opaque Chamber challenged the marijuana legalization effort earlier. Also just before yesterday's quick deadline*, the Arizona Restaurant Association challenged the initiative petitions for the minimum wage increase/paid sick time measure. That means that all three of the filed initiatives will be considered by the courts before they can be considered by voters in November. The hospital salary and minimum wage initiative challenges both seem more likely to be focused on the qualifications of petition circulators. Arizona law now requires a legal challenge of the paid circulators to be filed within one week of the petitions being submitted to the Secretary of State. (A longer deadline applies for challenging the validity of signatures.) Yesterday's challenges came at the end of the week. 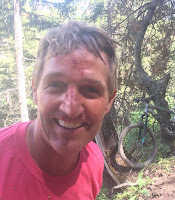 Although Sean Noble's interview led to a major FEC complaint against him and the Koch Brothers network for 2010 activities, he and his group escaped any penalties. Arizona's Politics reported earlier this afternoon on the large ($233,000) fines that Sean Noble's dark money allies agreed to pay the Federal Election Commission for hiding the true source of $50M worth of ads run in Congressional campaigns in 2010. The closing letter has been posted by CREW, and it indicates that the fined entities had violated federal law "by failing to identify donors who provided funds for the purpose of furthering certain independent expenditures and electioneering communications." However, the Commissioners could not agree on the one conspiracy count which included Sean Noble and Center to Protect Patient Rights (nka American Encore). It is not yet clear (to CREW or anyone) what the vote was on the conspiracy claim, nor whether there will be any written opinion about it. Arizona-based Sean Noble gave an interview to National Review in 2014, about how he and Randy Kendrick* raised and disbursed more than $50M through the Koch Brothers network. That article led to an FEC complaint alleging criminal conspiracy against Noble, his group and three of the groups to which he funneled money. Noble and his fellow defendants recently agreed to resolve the matter for a $233,000 fine. The monies collected by Noble's Center To Protect Patient Rights (nka American Encore) were granted to other dark money groups. The 60 Plus Association, American Future Fund and Americans for Job Security received grants from CPPR, ran ads in Congressional races and told the FEC (Federal Election Commission) that noone had contributed specifically for those ads. Noble also spoke in the National Review article about how he was able to expand the map near the end of that campaign, and that was also apparent in Arizona, as CPPR had 60 Plus sponsoring an ad attacking entrenched incumbent Raul Grijalva (CD7). Arizona's Politics has reached out to Noble for comment, and will updated with his response. * Randy Kendrick is an attorney married to Arizona Diamondbacks managing general partner Ken. Here is the 65-page ruling by a U.S. District Court Judge determining that Virginia cannot enforce a state statute that forbids GOP convention delegates from voting against Donald Trump next week as their Presidential nominee. READ, ARIZONA SUPREME COURT: Marijuana Odor Sufficient For Search Or Warrant...At Least Until Legalization; "Odor Unless" Standard, But Not "Plain Smell Doctrine"
The Arizona Supreme Court unanimously decided today that the odor of marijuana - whether overpowering or not - is grounds for "probable cause" to issue a search warrant or to search a vehicle... even with medical marijuana being legal. In twin opinions, the Justices rejected the somewhat playful term of a "plain smell doctrine" (playing off of the well-known "plain view doctrine". Saying the parties' use of the term was confusing, they instead noted that they were delineating an "odor unless" standard. Police are already allowed to sniff out possible criminal activity, and "odor" IS appropriate grounds for a search warrant. The "unless" refers to the also-already-existing case law that officers are required to include possible exculpatory evidence that would impact a magistrate's probable cause determination; evidence of authorized medical use would be an example of that. The Supreme Court opinions, authored by Chief Justice Scott Bales, also said that the Court's decision might become less relevant if Arizona voters pass a marijuana legalization measure expected to be on the November ballot. Notwithstanding AMMA, the odor of marijuana in most circumstances will warrant a reasonable person believing there is a fair probability that contraband or evidence of a crime is present. This conclusion reflects that AMMA did not decriminalize the possession or use of marijuana generally. A.R.S. § 13-3405(A) (criminalizing marijuana possession and use in Arizona); A.R.S. § 36-2802(E) (limiting immunity from civil, criminal, or other penalties for using marijuana to instances where “authorized under [AMMA]”). If AMMA had done so, or if Arizona eventually decriminalizes marijuana, our analysis and conclusion in this context might well be different. The first case overturns the Arizona Court of Appeals, Division 1, decision in the matter, and that case dealt with a storage unit being used to grow and store marijuana (and had the grower living in the unit). The second case vacated the opinion of Division 2, and found that the officers had probable cause to search a vehicle pulled over for a different reason, after they used their noses. WATCH: Rep. Gosar Questioning FBI Dir. Comey Re: Clinton: "If Not Now, When?" Arizona Rep. Paul Gosar (R-CD4) took his turn at questioning FBI Director James Comey this morning to advise him that he should have recommended a prosecution of former Secretary of State Hillary Clinton for her email setup and actions. "If not now, when?" asked Gosar. As a few other Republican Representatives had before him, Gosar compared the public statements of the presumptive Democratic Presidential nominee with the FBI's factual conclusions. Before giving up the balance of his five minutes to Rep. Trey Gowdy, Gosar told Comey "I would have recommended Clinton be prosecuted." The committee looking to raise Arizona's minimum wage to $12/hour by 2020 filed more than 271,000 petition signatures today. The 120,000-plus cushion is quite possibly the largest ever and virtually ensures that the measure will be on the November general election ballot. Tomas Robles, the chair for Arizonans for Fair Wages and Healthy Families group, indicated this morning that they are prepared to spend "multi millions" on the campaign over the next four months, after spending more than $300,000 to collect the petition signatures. The Arizona Restaurant Association intends to lead an opposition effort to the increase. President and CEO (and Maricopa County Supervisor) Steve Chucri told Capitol Media Services that a challenge to the petitions might be forthcoming, questioning whether registered voters signing the petitions were adequately vetted by circulators. However, with a turn-in of more than 148% of the state required number of 150,642 signatures, it would be nearly impossible to strike more than 120,000. After campaign finance reports indicate that the committee had paid more than $300,000 by May 31 to one of the top signature gathering firms (Sign Here Petitions) to collect and verify (signers and circulators), it is even more unlikely. 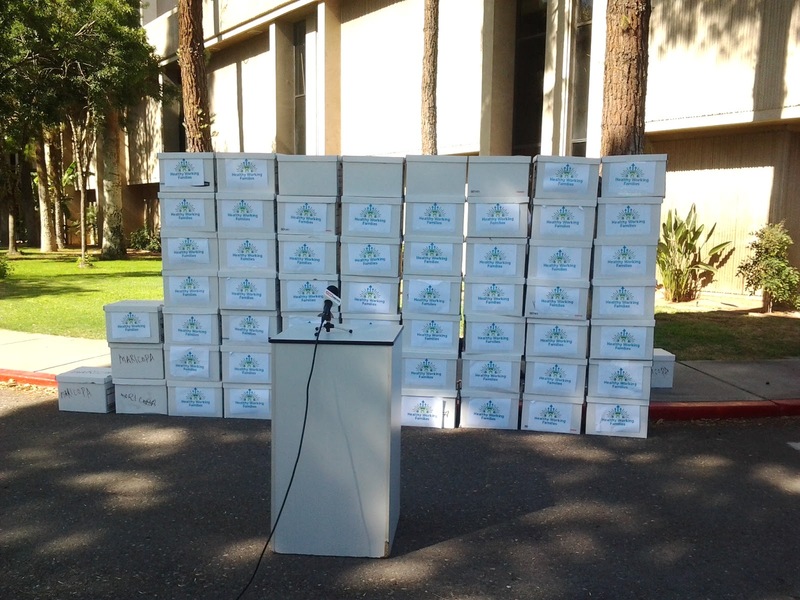 The marijuana legalization intitiative turned in more than 258,000 signatures last week. A third initiative limiting hospital executive pay is scheduled to turn in their petitions later today. While there have been constitutional amendment initiative efforts that have turned in more signatures (than the minimum wage effort) in the past - there is a higher valid signature requirement - it is unlikely that any of them turned in more than 120,000 excess signatures. Disclosure: Arizona's Politics co-founder Paul Weich has represented Sign Here Petitions. Donald Trump Threatens To Campaign Against Arizona Senator; Flake Replies He's Not On Ballot This Year, "Just Can't Support Him"
There is no picture of him wagging a finger (yet), but Arizona Senator Jeff Flake (R-AZ) stood up to presumptive GOP Presidential nominee Donald Trump today. Trump threatened to campaign against Flake, apparently without knowing which of his GOP colleagues are up for re-election this year. Flake is not up for re-election in Arizona until 2018. The Washington Post has more details on what took place behind the closed doors earlier today. 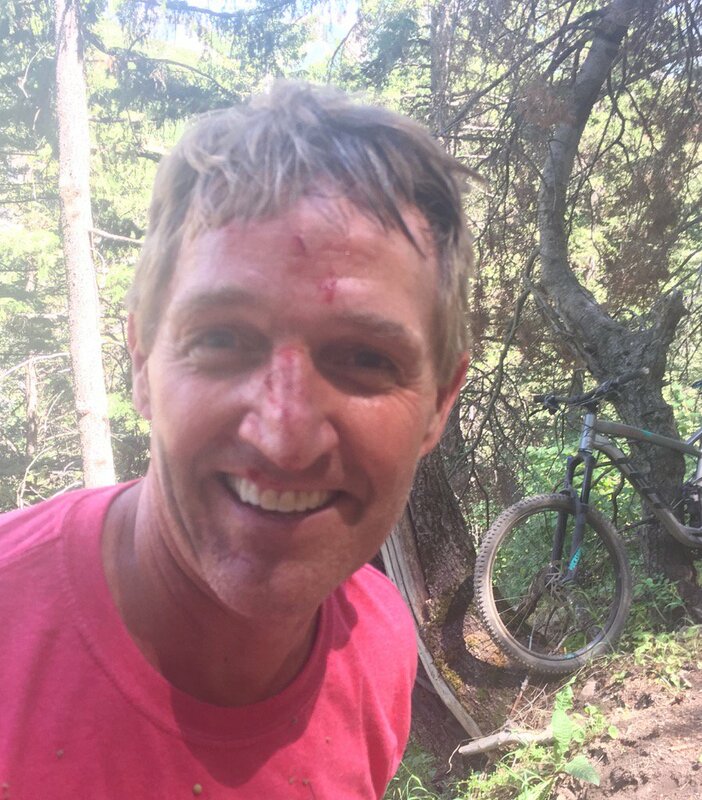 “Yes, I’m the other senator from Arizona — the one who didn’t get captured — and I want to talk to you about statements like that,” Flake responded, according to two Republican officials.